Looking for your next family escape? A mini break for the next Eid holidays coming up? Let me tell you about our weekend in the beautiful Al Bustan Palace, a Ritz Carlton property. You might be inspired by it's unique mix of old, new traditional elegance and family friendly atmosphere. 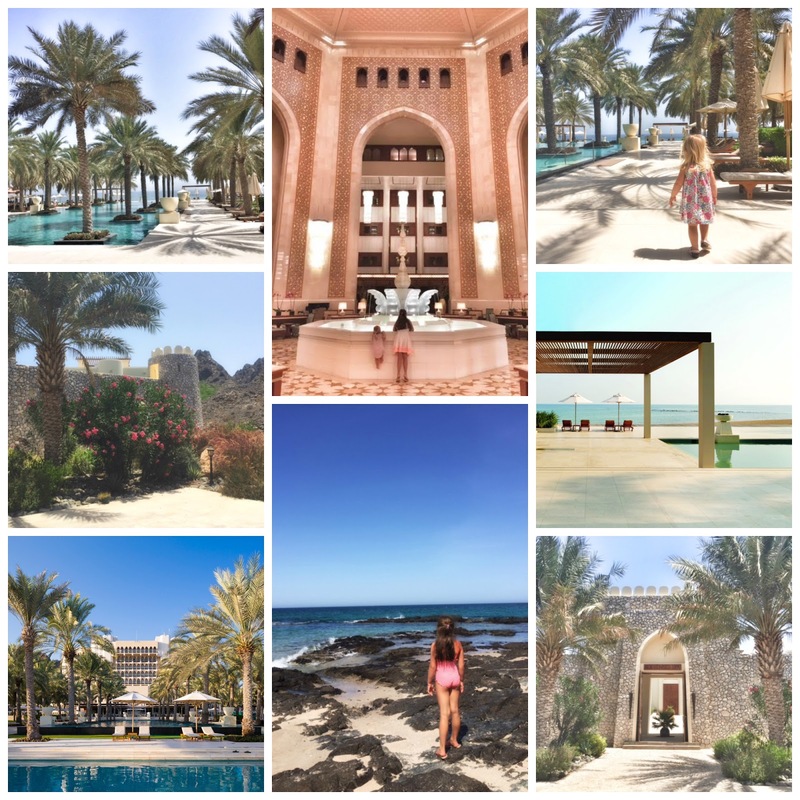 On a personal note, our visit to Al Bustan Palace last weekend was quite special for me. About 20 years ago, I came to Muscat with my family and stay in this beautiful resort. I have lovely memories of our time. 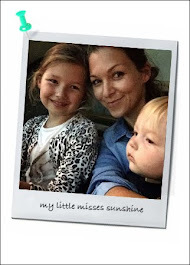 Coming back now, as a wife and mother of two little girls and being invited as a blogger to share our experience is part of the great circle of life. I am very grateful for this turn of event. Al Bustan Palace, also called the Jewel of the Sultanate, opened in 1985 for the first GCC Summit in the Sultanate of Oman. The imposing building stand strong against a dramatic backdrop with the rugged Al Hajar Mountains and the pristine Sea of Oman. 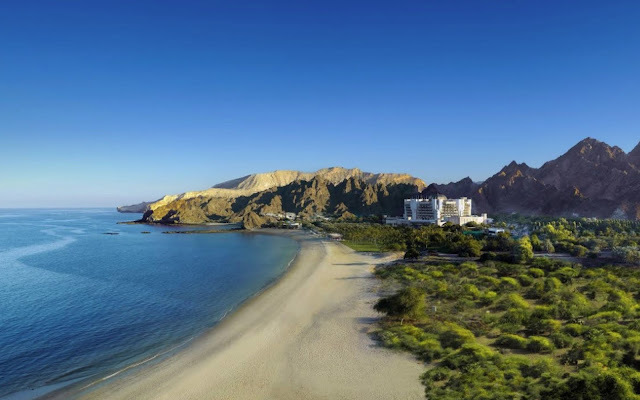 Conveniently located only one hour flight from Dubai, Muscat offers many beautiful attractions to explore: "Clifftop landmarks such as the 16th-century Portuguese forts, Al Jalali and Mirani, looming over Muscat Harbor. Its modern, marble-clad Sultan Qaboos Grand Mosque, with 50m dome and prodigious Persian carpet, can accommodate 20,000 people." The palace lobby is impressive by it's scale, shimmering gold walls and the grandeur of the glistering chandeliers. The rest of the hotel is more traditional of a Ritz Carlton resort. We stayed in an Executive Suite with Mountain view, perfect for a family of four, very plush and comfortable. 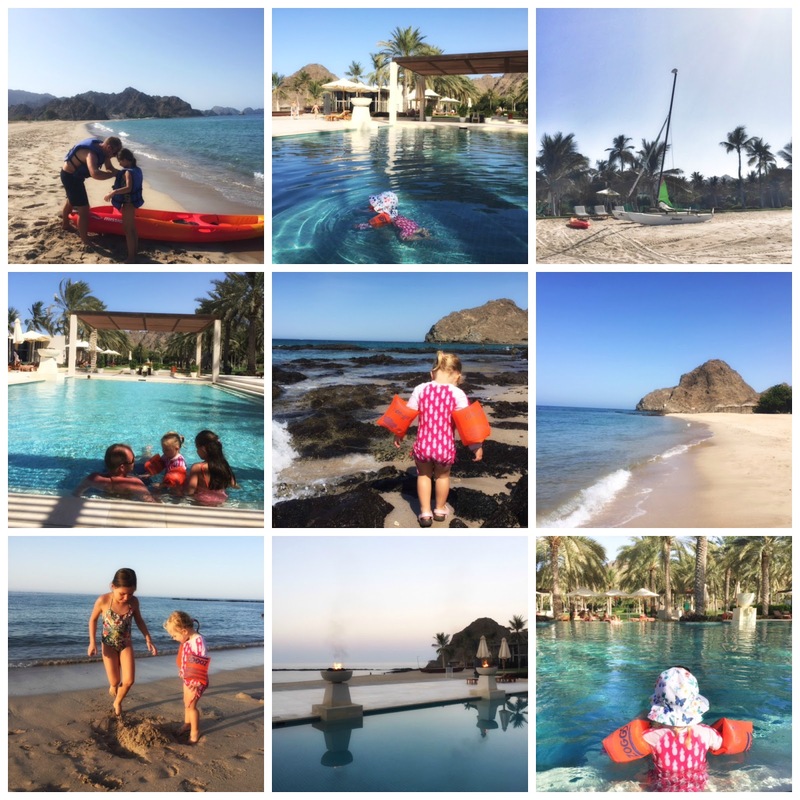 With 200 acres of lush beachfront and gardens, a 50-meter infinity pool, and the longest private beach in Muscat, Al Bustan Palace Ritz-Carlton Hotel offers many options for the family to be entertained. We spent most of our day by the main pool surrounded by lush palm trees. Our perfect spot was between the children pool (perfectly shallow for little Jo to paddle around), the sandy beach and the main infinity pool. I love, how close the beach is to the swimming pool and the bar. It's so convenient with little ones constantly exploring. There is some fun watersports activities offered by the beach club, such as catamaran excursions, kayak safari, and snorkeling with a video of your underwater experience. Luella and papa went out kayaking and snorkelling around the rocks. They got to see a puffer fish and enjoy some quality time together. The Ritz Carlton Al Bustan Palace is a family destination. A beautiful resort where children are special guests with privileges. On arrival, Luella and Josefin got to do their own fun checkin at the Ritz Kids counter. They were surprised to discover a very special set up in their room. 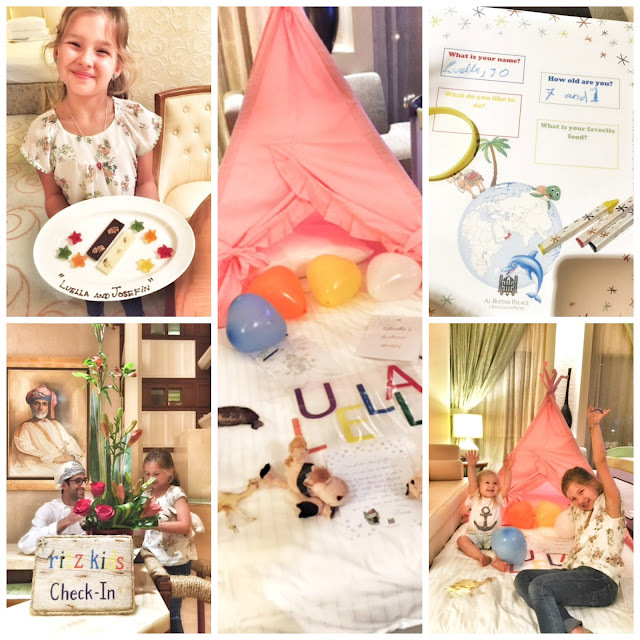 The in-room kids tent package has been created to add more family fun in the room, and can be personalized for the young pirates and princesses visiting Oman. Luella loved the tent set up over her bed decorated with balloons, soft toys, personalised letter and bedtime stories. Al Bustan Palace will make sure, little ones are entertained. 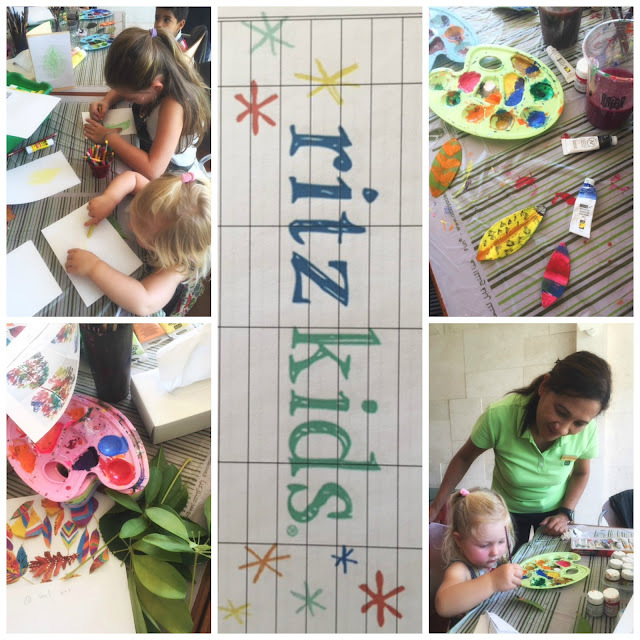 No Kids Club room, but the Ritz Kids children’s program. Ritz-Carlton propose a collection of inspiring, educational and most importantly engaging activities. Read the list of activities. The warm weather kept the girls indoor during "Ritz Kids time" but the crafty and environmental activities like Leaf Arts and Recycle Arts was a hit! We missed out on Indoor Ball Games, Origami and Aerobics... next time! While Luella enjoyed creating her summer scrap book with Janette from the kids activity centre, Josefin had some quality time with papa by the pool sipping on a milkshake. Treat! Me? 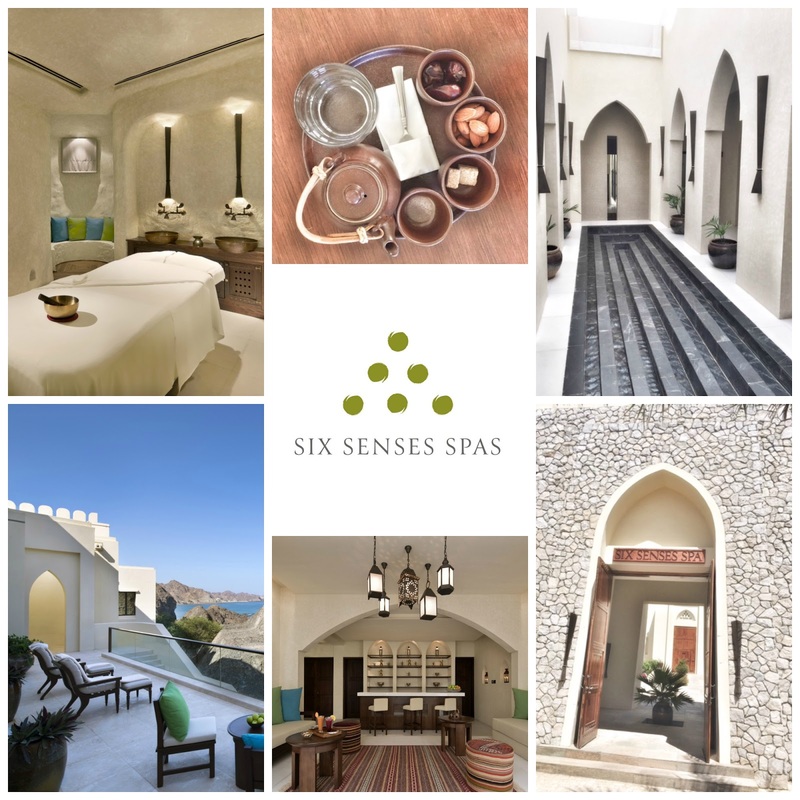 I had the chance to enjoy my own kind of treat at the Six Senses Spa. Beautifully designed surrounded by the mountains, the spa is a total wellness destination. Reflective of traditional Omani design like an ancient Arabian fort, heavy wooden doors for the imposing entrance. Inside the soft, elegant and minimal interior is just beautiful and inspire relaxation and peace. The 90 minutes body massage was just what mama needed to relaxed some knotted shoulders and stressed lower back. Perfectly done with smooth but firm strokes. The acupressure and skin rolling were the perfect combination to feel relaxed but also rejuvenate. Bliss. Full spa menu and details here. On Saturday after a lovely breakfast on the terrace facing the infinity pool, we took a ride to the Marina. We could not leave Muscat, without a boat trip along the gorgeous coast. The waters around Oman are filled with extensive marine life and one of the most familiar sights is the dolphins. We were lucky to see many dolphins swimming, jumping around our boat. It was a lovely experience and all very exciting for the children. Such fun adventures that both girls fell asleep on the ride back to the hotel. Al Bustan Palace will book for you the Dolphin watching boat trip, it last about two hours and cost around OMR 17.000 Per adults / OMR 10.000 child, which include transfer from the hotel and refreshments. - Lovely resort only one hour flight from Dubai. - Peaceful and relaxing Al Bustan Palace is not the busy resort with Friday Brunch music in the background. It offers a more tranquil approach for the family. - Weather was amazing! About 10C to 12C degrees less then in Dubai, we enjoyed our breakfasts, lunches and dinners outdoors! Priceless. - Unfortunately, during our visit two of the restaurants were closed (Beach Pavilion and China Mood). We had breakfast and dinner at Al Kiran terrace. The all-day dining experience with a large buffet, live cooking stations and themed nights. Hubby and I are not fans of buffet set up but it was well prepared and appetizing. We enjoyed it just like the girls. I believe the currently closed restaurants will be open again next month. - Lovely family resort, with plenty of family time but also enough for children to to participate in fun, educational activities and adults to kick back and enjoy the facilities. We sure did! Thanks for having us. Look forward to be back. *The free night will be reflected as a 33 percent discount on each night. Package available for stays between May 15, 2016 - September 17, 2016.